Perth, where I live, has a superb climate. Everyone who lives here knows it. To my mind, April is the most magnificent month of the year and this year, April weather has extended into May. Ridiculous amounts of mild/warm weather and blue skies. 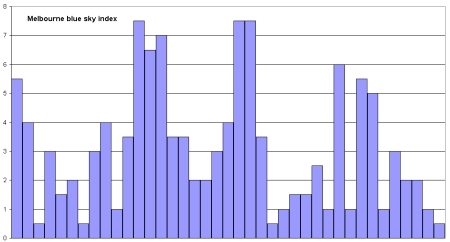 The stats across the 39 days average out to a number that the Bureau of Meteorology define as a “clear” day. 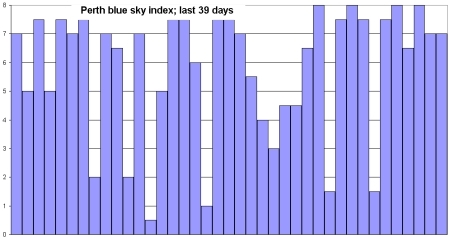 There were 4 days that individually would fit the category of a “cloudy” day. Not hard to cope with, since these days were all 25 degree-ish. You could always stay indoors. 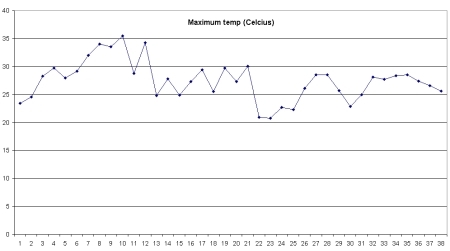 Here’s the Perth maximum temp over the last 38 days; maxima overwhelmingly between 25 and 30 degrees Celcius (77 and 86 Fahrenheit). Wind averages 10.5 kph (6.5 mph). I think the official classification is ‘pleasant’. 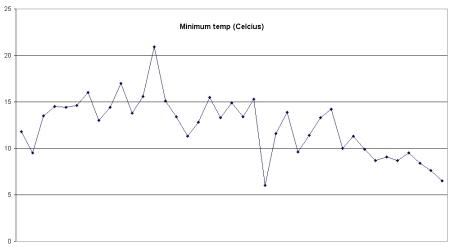 And relative humidity averages 46%, officially, ‘very bloody pleasant’. Okay, maybe not official. Rain – only 5mm on the 14th April. We all took the day off. Maybe W.A. hasn’t got the best job in the world…. but kills Qld for the weather! None of that nasty rain!